WASHINGTON–More than 1 million copyright-infringing website domain names selling counterfeit automotive parts, electrical components, personal care items and other fake goods were criminally and civilly seized in the past year through the combined efforts of law-enforcement agencies across the world, high-profile industry representatives and anti-counterfeiting associations. The ongoing intellectual property enforcement initiative targeting fake websites, dubbed Operation In Our Sites, was facilitated by the National Intellectual Property Rights Coordination Center (IPR Center), a joint-task force agency led by U.S. Immigration and Customs Enforcement. The IPR Center, which stands at the forefront of the U.S. government’s response to IP theft, worked directly with key international law-enforcement authorities and industry organizations representing the electronics sector, luxury brand-name designers, film and entertainment and several entities specializing in apparel and accessories through the major enforcement effort. Roughly 33,600 website domain names were criminally seized in a collaborative effort between ICE’s Homeland Security Investigations (HSI), Europol, Interpol and police agencies from 26 different countries. Industry partners participating in the operation were fully responsible for civilly seizing 1.21 million domain names and shutting down 2.2 million erroneous ecommerce links featured on social media platforms and third-party marketplaces. Investigations led by HSI resulted in the removal of copyright-infringing websites that sold counterfeit airbags and integrated sensors, both commodities that present a potential safety hazard. An investigation based in Louisiana led to the seizure of five website domain names – including Chinaseatbelt.com; Airbagpart.com; Chinasafetybelt.com; Fareurope.com; and Far-europe.com – involved in the sale of fake automotive parts. A joint case between HSI and Department of Defense investigative agencies resulted in the removal of PRBlogics.com, a copyright-infringing website offering counterfeit integrated sensors. 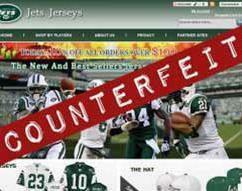 Each year, the market is flooded with counterfeit products being sold at stores, on street corners and online. Additionally, criminals have taken advantage of the internet to deceive, sell and ship fake products directly to American consumers. The most popular counterfeit products seized each year include watches, jewelry, handbags, wallets, wearing apparel/accessories, consumer electronics/parts, pharmaceuticals and personal care products.